Homefront in WWI: A citizen's letter turns in some soldiers gone AWOL. A volunteer worker at the National Archives found this letter in the records of the American Expeditionary Forces (10th Division) earlier this year. In the note, concerned citizen Thomas J. Hartman wrote to Maj. Gen. Leonard Wood, then in charge of training at Camp Funston, Kan., where the 89th and 10th Infantry Divisions prepared for service in Europe. Hartman, a resident of Raymond, Kan., identified three soldiers from his hometown who had been bragging about leaving training. This obviously bothered Hartman, who offered to turn in even more “slackers” if the general would send “a good man” along to chase them down. At the beginning of the United States’ involvement in World War I, the military was in desperate need of manpower. The Selective Service Act of 1917 allowed for conscription of registered men to fill the armed forces’ needs. Between September 1917 and November 1918, almost 3 million men were inducted through Selective Service. It’s possible that the brothers Price and “Shipler” (identified only by surname)—obviously unwilling soldiers—were draftees. Clearly a wary dweller of a very small town, Hartman asked to remain anonymous and added that he had made a special trip to mail the letter, as the postmaster was not to be trusted. A transcript follows after the image. 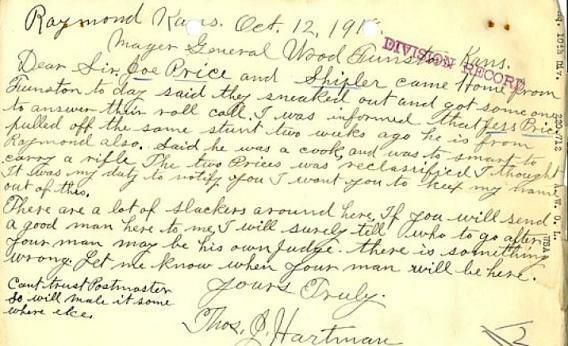 Letter from Thomas J. Hartman to Maj. Gen. Wood, Oct. 12, 1918. RG 120, Records of the American Expeditionary Forces, HQ 10th Division, 220.712. National Archives. Major General Wood Funston Kans. Dear Sir. Joe Price and Shipler came Home from Funston today said they sneaked out and got someone to answer their roll call. I was informed that Jess Price pulled off the same stunt two weeks ago he is from Raymond also. Said he was a cook, and was to [sic] smart to carry a rifle The two Prices was reclassified I thought it was my duty to notify you I want you to keep my name out of this. There are a lot of slackers around here, If you will send a good man here to me, I will surely tell who to go after. Your man may be his own Judge. There is something wrong. Let me know when your man will be here. Can’t trust Postmaster so will male [sic] it some where else.